Gritty, the new mascot of the Philadelphia Flyers, looks to God for support in the face of heavy backlash. 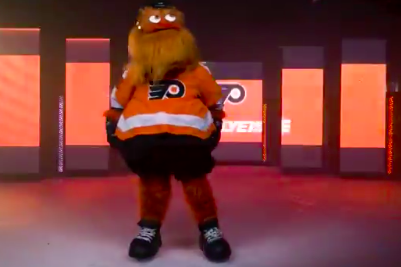 The Philadelphia Flyers unleashed a monstrosity on the hockey world Monday morning with the debut of Gritty, a googly-eyed corpulent hair-ball on skates. Even though the introduction took place at the Please Touch Museum, most Flyers fans responded to the new mascot with horror, noting that kids would likely not want this creature to get anywhere near them. Gritty memes popped up on social media throughout the day Monday, comparing him to ugly characters from a variety of movies and TV shows over the years. And then came the change.org petition to "Get rid of Gritty," whose real purpose is to give the Flyers a kid-friendly program for the team's community engagement initiatives. Should the Flyers just cave and pull the plug on this experiment? Not according to Jerome Bartlett, aka the Mascot Guru. "There's always a backlash," said Bartlett, a touring mascot expert who consults athletics programs and produces pep rallies around the country. "People don't like change in sports, especially when there's a lot of history. This happens all the time in professional sports, but it usually bounces back. The team has to stick to their guns and support this guy." Bartlett pointed to Philadelphia's other weird mascot celebrity, the Phillie Phanatic, as evidence of the reversal that tends to follow the backlash (see also: Blooper of the Atlanta Braves). When the Phanatic debuted in 1978, Philadelphia jeered at the flightless green bird from the Galapagos Islands. "Phillie Phanatic is an ugly character, and they hated him at the beginning," said Bartlett, who's based in San Antonio and has worn costumes for the WNBA, AHL and various NCAA programs. "But the Phanatic became one of the first baseball mascots to actually do something. There were no rules. His behavior actually meant they had to be made." Dave Raymond, the original Phillie Phanatic, was consulted in the creation of Gritty and also served as a mentor to Bartlett. "Everybody pretty much knows everyone in this world," Bartlett said. "We remain in contact to this day." If you look at the chatter in the mascot world, Bartlett said it's been all positivity surrounding Gritty. "Gritty will have some friends and people looking out for him," Bartlett said. "He's going to have support from other NHL mascots." Bartlett's honest opinion is that Gritty is actually an awesome mascot. "When I saw it, I was like, 'oh my gosh this is a fantastic, unique character,' just on the marketing side. It's unlike anything I've ever seen," Bartlett said. "It's not a cute and cuddly character, but it can be. Chubby mascots are always going to be funny. In my opinion, it's perfect for a hockey team. Especially for the Flyers, which have that gritty history." At the end of the day, Bartlett explained that having a mascot is about connecting with the community and giving kids a symbol to embrace when players aren't available for events and autograph opportunities. He envisions a future where mascots are enlisted for bullying prevention programs at schools. In the meantime, he's not going to sugar coat the Gritty gig. "That mascot has a long road ahead of him to prove his worth," Bartlett said. "If they have a very skilled and talented performer, it will work out. Theres' a lot to work with between the googly eyes, the belly, the furry face and the jumbo skates." People protesting the mascot should be considered a vocal minority, according to Bartlett. "The team really has to support this guy, and I'm sure they will because they invested a lot in this decision," Bartlett said. "It's kind of a lonely job being a mascot.Everyone knows who you are, but only when you wear the costume." Like him or not, Gritty is probably here to stay for a while, Flyers fans.